Doran QC Weigh allows you to observe plant-wide quality control data from a single PC. Control limits are color-coded so you can quickly identify issues in your production processes. Data is digital and stored in a database for retrieval—eliminating unreliable, handwritten records. • View critical Quality Control data in real time. • QC data that you can trust. • Easy to configure and use. QC Weigh (item # SFT0006) allows you to observe plant-wide quality control data from a single PC. Control limits are color-coded so you can quickly identify issues in your production processes. Data is digital and stored in a database for retrieval—eliminating unreliable, handwritten records. Scale operators are prompted to take samples at intervals that you specify. Using unique operator IDs, scheduled sample intervals with alarms, and data collection ensure that employees are performing quality control tasks. Reducing the cost of poor quality begins with actionable data delivered quickly and accurately. 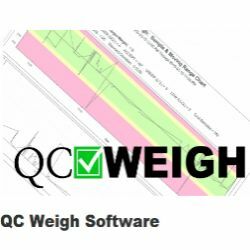 QC Weigh software achieves that by capturing quality control data as it is taken and transmitting the data to your desktop. On-screen display is not the only way QC Weigh displays production data. At an interval that you choose, the software will generate a .PDF-formatted report organized by product line, sample number, and product. This report will arrive in your e-mail inbox, delivering your company’s QC Data to your desktop or smart phone, the palm of your hand. These QC control charts are a valuable snapshot of daily production performance. Quality control data is often collected as it was at the beginning of the industrial revolution, using pen or pencil and paper. While this method is easy to perform, it’s known to be inaccurate, and the pages and pages of hand-scrawled characters make it almost impossible to spot patterns and pinpoint manufacturing problems. Quite often, handwritten records show that the product is always the same weight, when in reality that is impossible. Missed weighments mean that production equipment is not being adjusted to keep products in tolerance. Inaccurate QC forms make the managing and understanding of how to improve product quality an impossible task. Increase your plant’s profits with accurate digital records captured and archived by QC Weigh. Configuring QC Weigh and the 2200CW Scale is an almost effortless task thanks to the drop-down menus and easy-to-understand program prompts. Each product has parameters for checkweigh tolerances, product description, ID, number of weighments, and time between samples. During the manufacturing process, the employee responsible for sampling product weight is prompted to enter the product ID and their operator ID. Requiring operator IDs keeps the employee accountable for taking QC weight samples at the predetermined intervals. Management can use these records to track and evaluate employee work performance. When the scale operator logs in, the scale displays the seconds until the next weight sample is required. Once the scale timer reaches zero, the large red LED display will read LATE. For processes requiring multiple samples, the employee is prompted through the process of weighing each sample.